The following is a very simple rule: Stay hydrated to fight depression. Our human brain is estimated to be 80 percent water. So it makes sense to hydrate for depression and maintain the highest levels of our brain's operation by providing it with liquids. Staying hydrated also helps your body. When you workout, as I recommend in this depression help program, staying hydrated promotes your muscle tissues to rejuvenate, repair, and grow. Drink all Day. Drink 8 to 10 glasses of fluid a day. 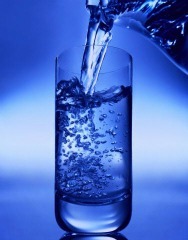 Water is the most pure source, and should make it a good part of your drinking during the day. But other drinks are also very beneficial, and should be included in your daily drinking habit. I personally gulp down a big glass of water (about 8 ounces) every morning as I get up. This ensures I start early with hydrating myself before I get sidetracked on other chores, such as showering, dressing, making breakfast, etc. Mornings, after a good night's rest, are when the body has the most amount of time without food or water, so it's good to start early with depression self help habits. Drink low to no caffeine teas. Teas are an excellent source of hydration, plus a few possess healing qualities. Green, and Chamomile tea are some of the best to combat depression, stress, and general health. Green Tea. green tea contains L-Theanine, an amino acid which creates mental calmness. L-Theanine also helps promote alpha brain waves. Theanine works with, and actually counteracts the small amount of caffeine in green tea, to give you an alert, yet relaxed, awareness. Green tea is not only recommended for depression, because it increases levels of serotonin (the happy hormone), but its antioxidant composition has proven to help tremendously with diseases and even cancer prevention. Not only that! Green tea also contains powerful anti-oxidants that inhibit cancer cell growth, lowers cholesterol and blood clots contributing to the prevention of heart attacks and stroke. Want a tip? If you eat meat, drink green tea. This greatly reduces the amount of carcinogens there may be on the meat. All around green tea is my drink of choice! Chamomile Tea. Chamomile tea contains bisabolol, which has anti-irritant, anti-inflammatory, and anti-microbial properties. This makes it a good home remedy drink for treating anxiety, insomnia, panic attacks (major contributors to depression), muscle twitches, wounds, burns, and scrapes, skin conditions and stomach problems. Drink all day to stay hydrated to fight depression. Your body and mind will become well equiped to deal with tension and stress that form part of life. Live in health and happiness, and stay hydrated to fight depression.